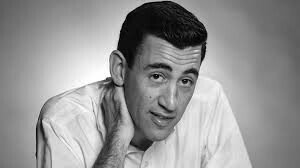 Salinger created a literary sensation with his 1951 novel The Catcher in the Rye, whose troubled adolescent hero, Holden Caulfield, was hailed as a 20th century Huckleberry Finn, an innocent lost in a corrupt society. The novel struck a chord in the American consciousness that has yet to cease reverberating. Salinger shied away from the celebrity that followed the publication of the novel, wrote only 13 short stories in addition to it, and has lived a secretive life ever since.